This page has a lot of photos and takes awhile to load. But that's what it is about. If you want to see a larger version of any photo, click on it. Ten years, each morning spent walking my dog (or dogs) down by the river. That river is the Little Thompson - a small stream, really - just an eighth of a mile from my home. 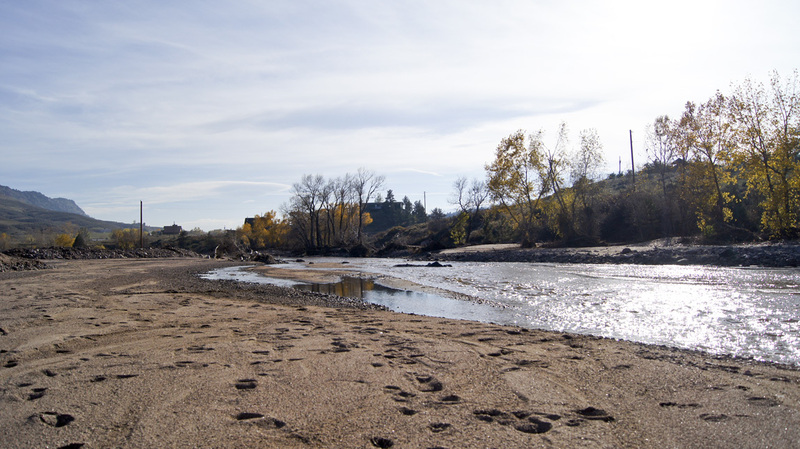 In winter we walk along the road, but in early spring, when mornings are light and rattlesnakes sleeping, we walk next to the river. 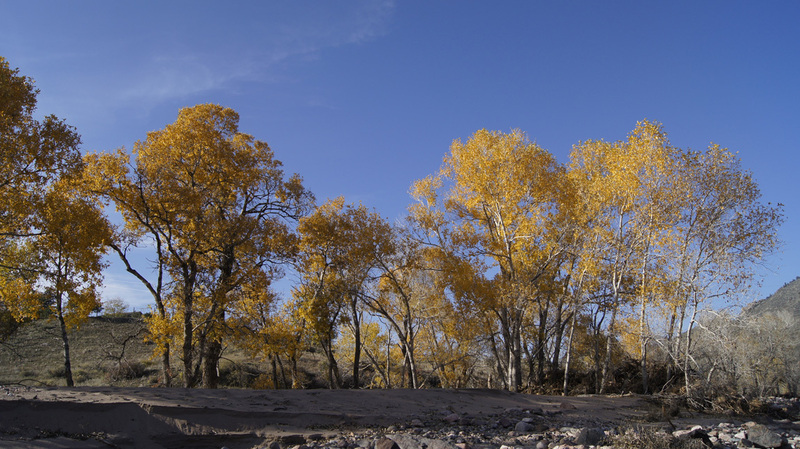 Up along the grassy river bank, under the trees, then across the fire sub-station parking lot, and back home along the road. Each first springtime river-walk, I follow Lucy, as the path is not visible to my eyes, only her senses; after a few days, the two of us make a clear footpath, winding through the weeds, trees, and rocks. Past tracks of animals, startled deer, squawking magpies. Perhaps not picturesque, but wild and â€œoursâ€. Back-up thirty years to when we moved here in 1981. There werenâ€™t many homes back here in the X Bar Seven, and my cats used to follow me down to the river - there was that little car traffic. 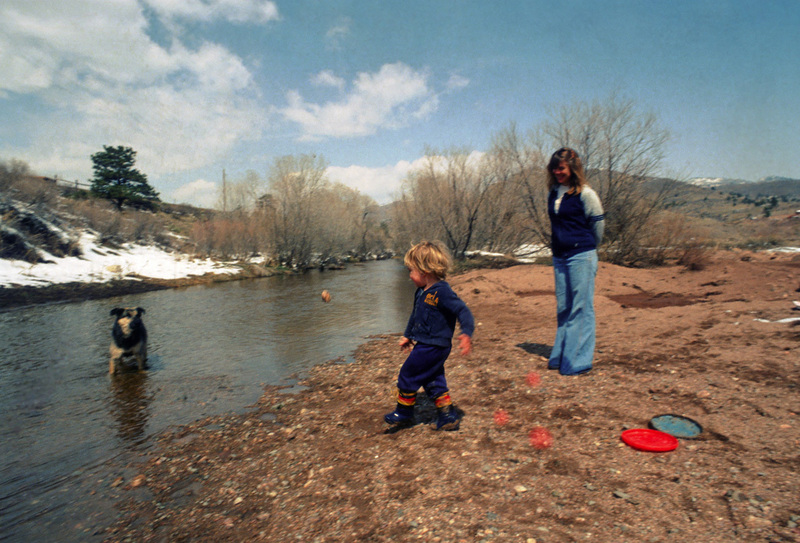 It was a great place to take a toddler and our frisbee-fetching water-loving dog named Rocky. In the 1980s we were among a lot of young families in the X Bar Seven. My son jumped on his BMX to zoom to the river area; my daughter slung her ice skates over her shoulder and made a path through the snow to glide on the frozen pools. Summers it was swimsuits and rafts. There used to be a beaver dam down there. Sometimes neighbors would gather at the area under a big tree near the pools - before the fire station was built - and party. One day lightning hit the big tree. Scary, since a few people were pretty close. The blackened skeleton stood for years. 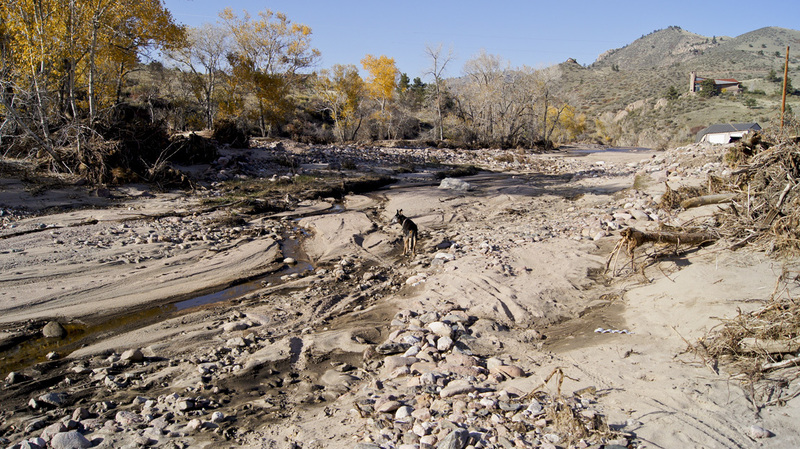 Here is Jamey and our dog Peppy down by the river. 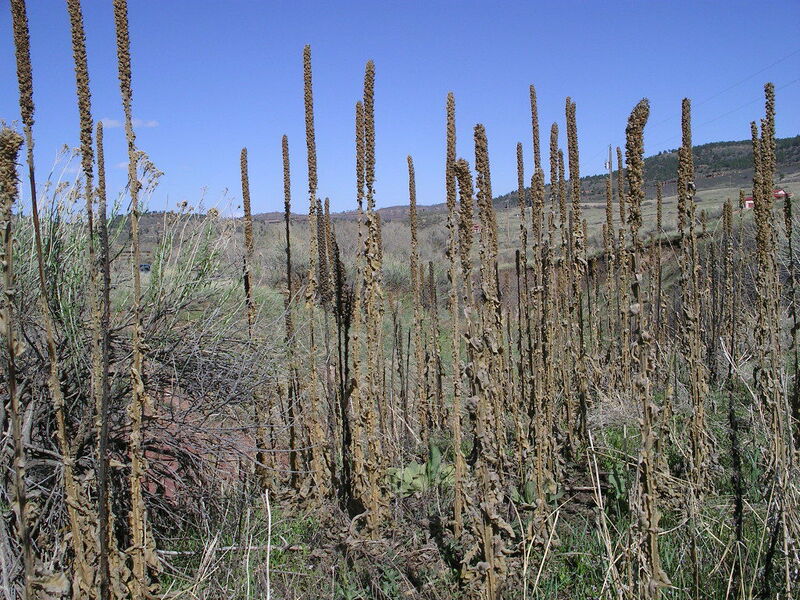 Tammy liked the area so much that we took her graduation photo there. Here she is by herself and with Lucy when Lucy was young. 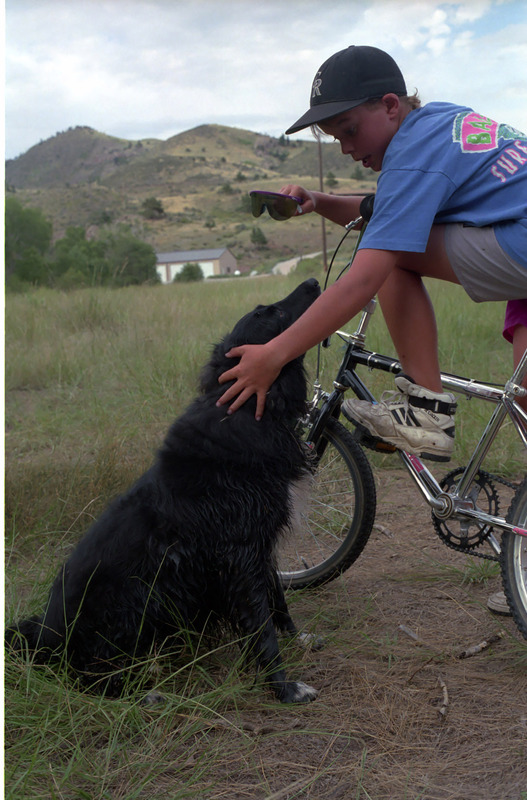 In about 2000 I began my years of morning dog walks. Each morning I would stop, live in the moment, and realize how special it is out here. Funny, I never thought to take photos specifically of the Little Thompson. It just was. So . . . why am I waxing nostalgic? Why did I take all the photos below? 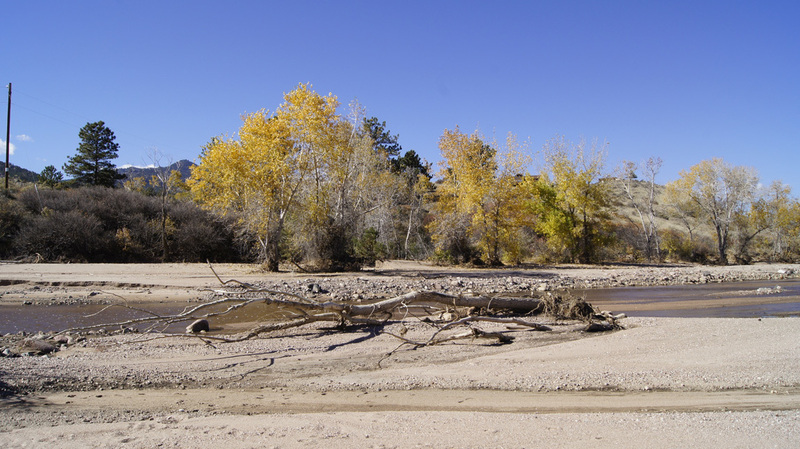 Because of the Lyons floods in September 2013. The area has totally changed. One intent of his blog is to show my daughter who is living in Africa what our old playground now looks like. Here goes. How it looks now. 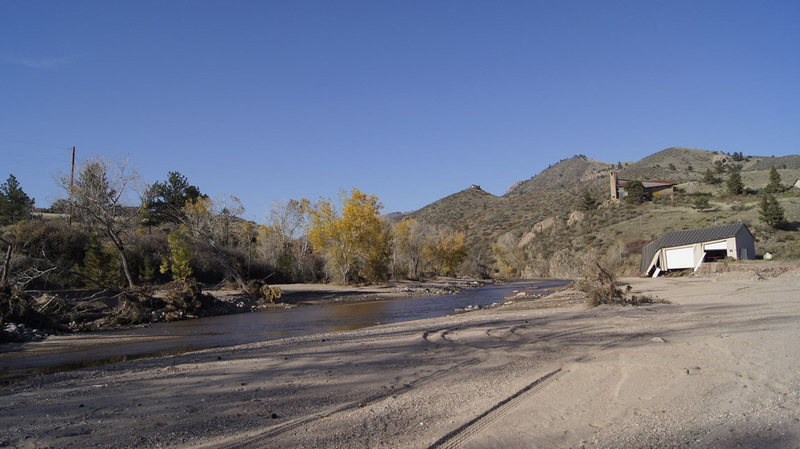 Below is the bridge built during the 1990s flood, intact, with the mostly-intact concrete spillway past it. Then past the spillway is the new roadway, made by piling quarry rocks above three long culverts. That was done while the river was still running like crazy on the Sunday after the flood. To the left of the bridge is the debris that they pulled from the bridge. During the flood, it was totally clogged and running both over the bridge and from there all the way to the fire station. The swiftest and most destructive water flowed just past the old spillway. What you are seeing in the photo below is the repaired road (hopefully it will be fixed better later). 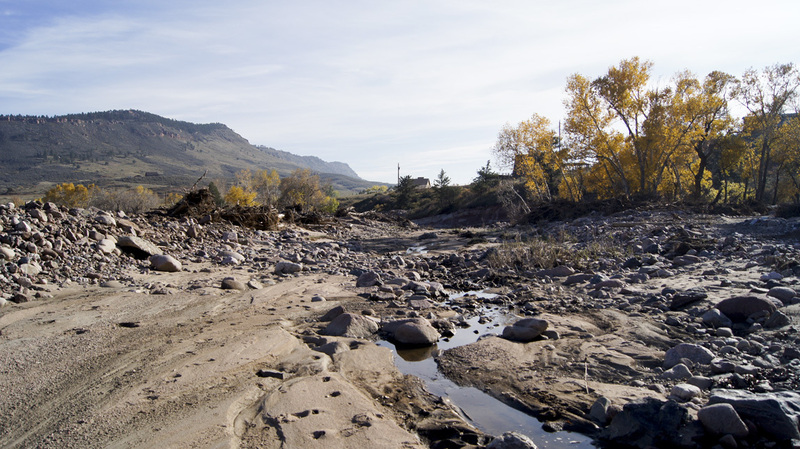 When the river was still running fast, they pulled in the heavy equipment and scooped up rocks to re-channel the river. 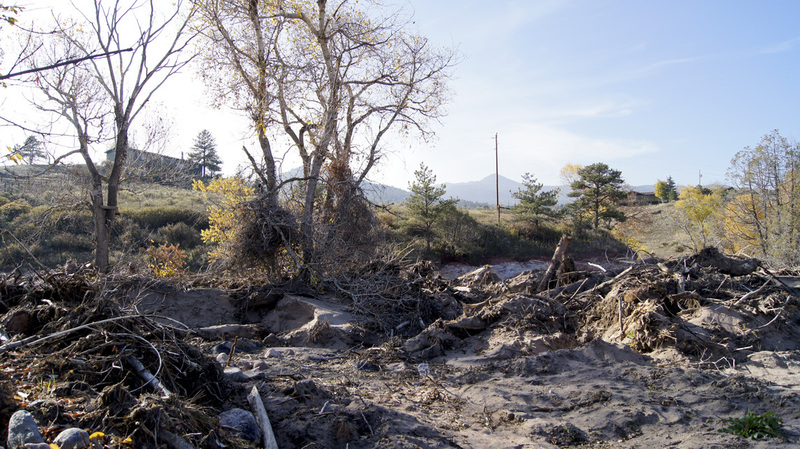 As the machines worked, Search and Rescue and National Guard forces stood at intervals along the rushing river, ready to act to rescue people if one of the machines fell over in the current. Then they dropped in long culverts and piled up slash sandstone rocks from the quarry. That was covered with smaller chunks. Drivers still have to go very slowly over those rocks. 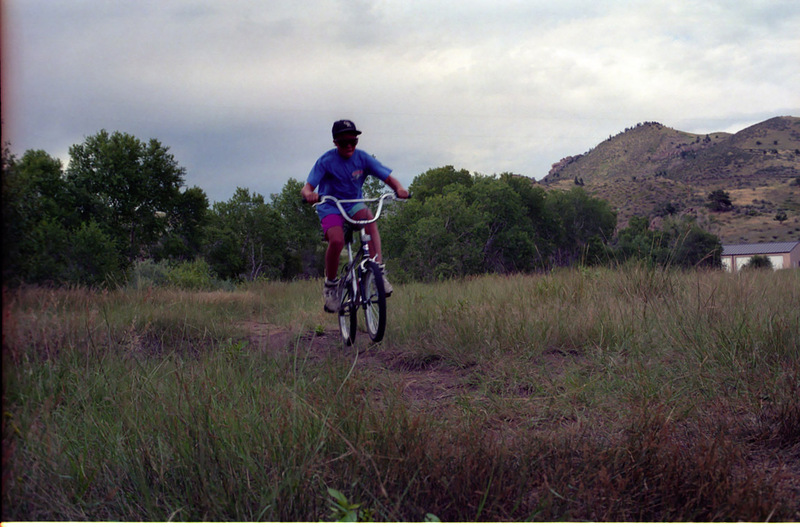 I can make it over with my mountain bike if I keep my wits about me. Lucy crosses them very slowly. This old pine tree remains. I used to walk to the left of it; to the right was just a flat field filled with grasses and flowers and common mulleins. The big FEMA trucks went up this way and then over to the shallower area in front of the fire station to evacuate the stranded people that live the other side of the Little Thompson. Chinooks also landed in the field to evacuate people that wanted to leave. 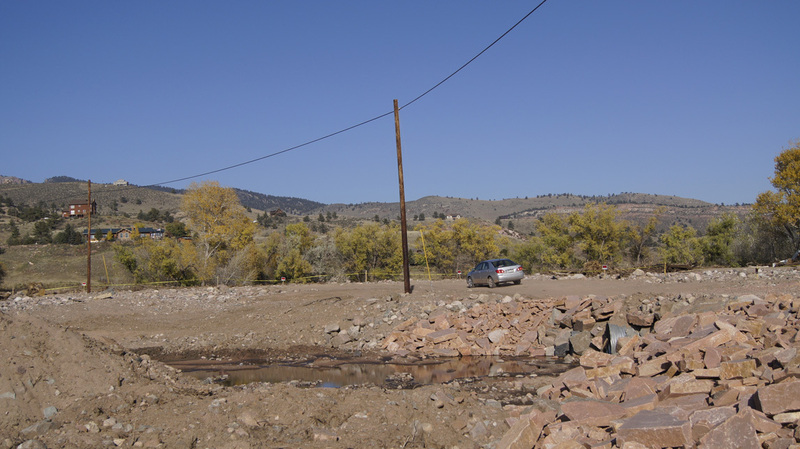 Most residents stayed and waited for the road to be fixed. The old swimming hole and skating pond. A lot of it is now filled in with sand. The old silo is missing most of the lower bricks. It will probably have to come down. In the distance is the remaining half of what we always call the â€œBrowningsâ€ house (the original X Bar Seven homestead). I have closer photos, but I am not going to share them. It is too private, and not my story to tell. A street sign? Well yes, but it used to be several miles up the Little Thompson. 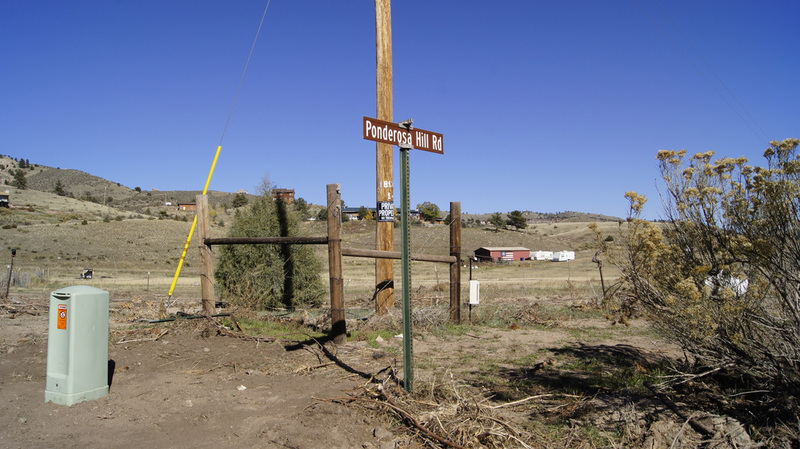 It says â€œStagecoach Trailâ€ and â€œPinwheel Ranch Roadâ€. Continuing our walk, this is the view up towards the fire station. All of the river is now pretty much where it was pre-flood, but during the flood, one of the three swift channels ran along here. And here in the distance is the fire sub-station. I turn around and take a photo of the way we came. Note the piles of river rocks. I was told that these rocks have been buried for about twenty thousand years. They are ancient rocks, seeing the light of day for the first time in ages. 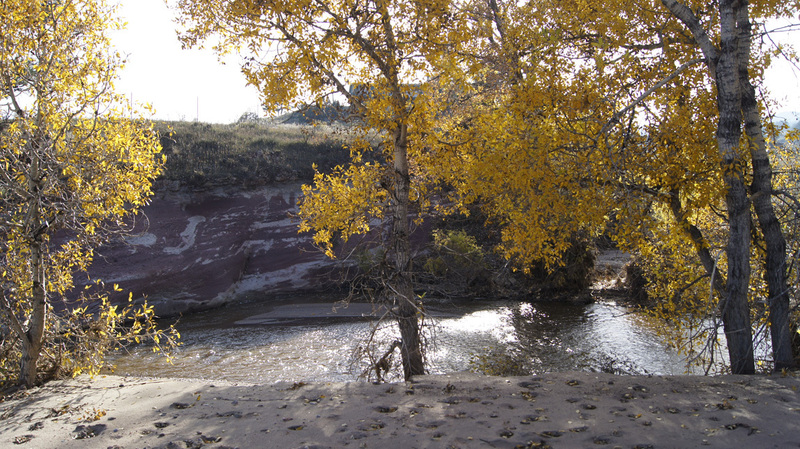 We have also heard that there might be gold in the rocks washed down from the Colorado Rockies. Fire station, closer. This big stretch of sandy area is soft on an old dog's feet. This shows clearly how deep the river was during the flood. This is where the fire station parking area was. See the red barn/shed? Just beyond it is where the Chinook helicopters landed. Looking up the Little Thompson from the fire station area. This is the view down the road coming back home from the fire station. 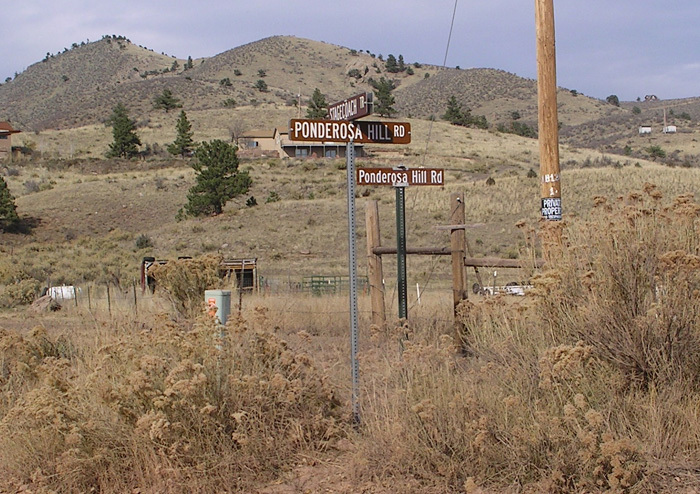 This is the sign for the junction of Ponderosa Hill Road and Stagecoach Trail. This was under water during the worst of the flood. The fall trees still blaze against the sky. The whole area still has beauty, itâ€™s just different than it was before. Each morning I stop, live in the moment, and realize how amazing the world is. We stayed in our own house the entire time. 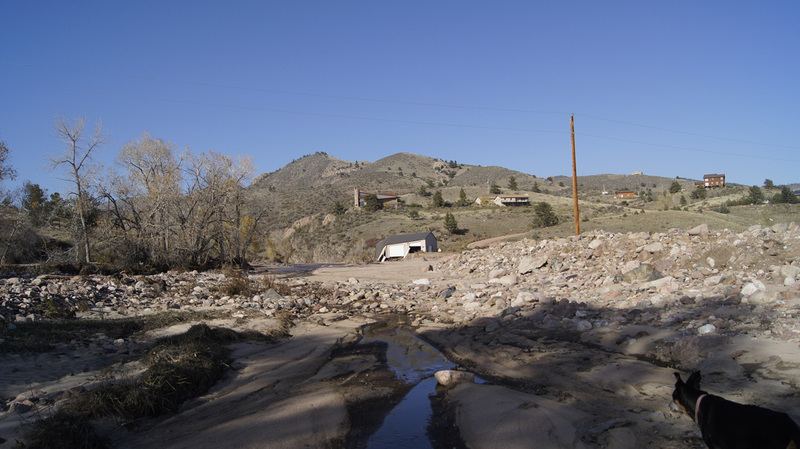 But not so most Lyons residents: the sewer and water systems in the town of Lyons proper were destroyed. Gradually, power is being restored, so that by October 11 most neighborhoods do have power, and some have phones. Residents are discouraged from staying in their homes because of the sewer and water situation. The town has port-a-potties everywhere. A few businesses are open, even the stores, at least on a limited basis. 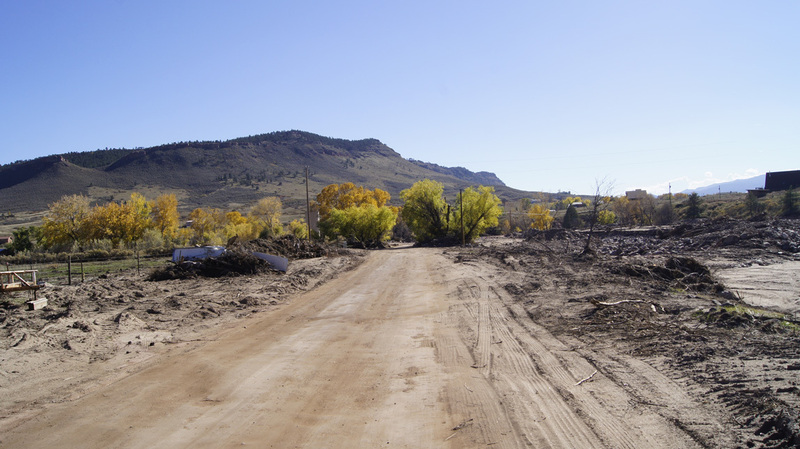 The town is building temporary water and sewer systems and they believe that by October 26-November 11, residents will be able to move back home. Things in town are slowly getting back to normal, but most of the town residents are still displaced, renting temporary apartments in nearby towns. The kids are going to school in Longmont. On October 11, Mayama re-opened. It was wonderful to go to a Nia class and reunite with my friends in Lyons! What a wonderful community we have. But wherever they are living, they remain Lyons people. Lyons Strong. 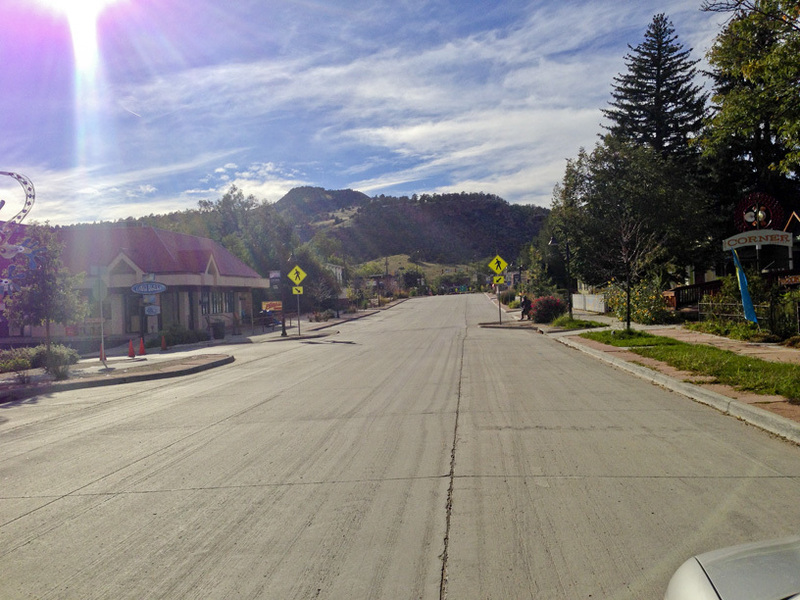 The empty Main Street of Lyons, September 29, 2013. Wednesday evening (Sept. 11) it begins raining. Steady and hard, but not bucketing down. Sometime around midnight John gets up and checks the rain. The backyard is full of water, enough so that it backs up to the house and finds a couple pipe-holes into the basement. He sets up a sump pump in the backyard, and collects dripping water in the basement. At the worst, he was carrying a 5 gallon bucket up from the basement every 5 minutes. Meanwhile, my iPhone keeps giving alerts from the CU Boulder. 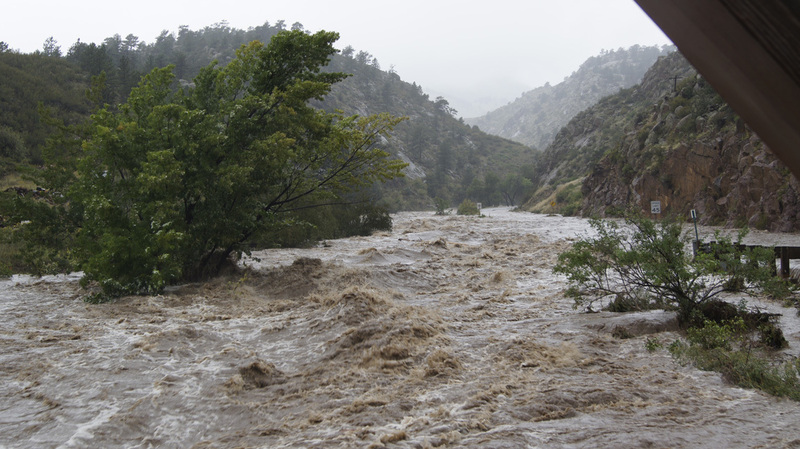 A flood alert is in effect for the Boulder campus, with everyone advised to seek higher ground. Campus is closed for the day by about 4 a.m.
We are not too worried, since we are not right next to a river and the basement flooding is manageable. About 4:30 a.m., I hear the neighborâ€™s truck start up. Uh oh, the Little Thompson could be flooding. I watch as he drives to the river and comes right back. The river must have flooded the road. Then he goes out towards the main road. I watch and sigh in relief as he crosses the area over the culvert that could flood, the one between us and the mailboxes. As soon as it is light, I walk down to the Little Thompson. You cannot believe how huge it was. The road is washed out, cutting off the fifty or so homes back there. We still have power and phones Thursday morning. The news for Boulder looks bad. But Lyons is worse. The rivers that run through town (the St. Vrains) have breached their banks and all of the bridges in town. Residents of our immediate area gather informally at various informal points and news is transferred. 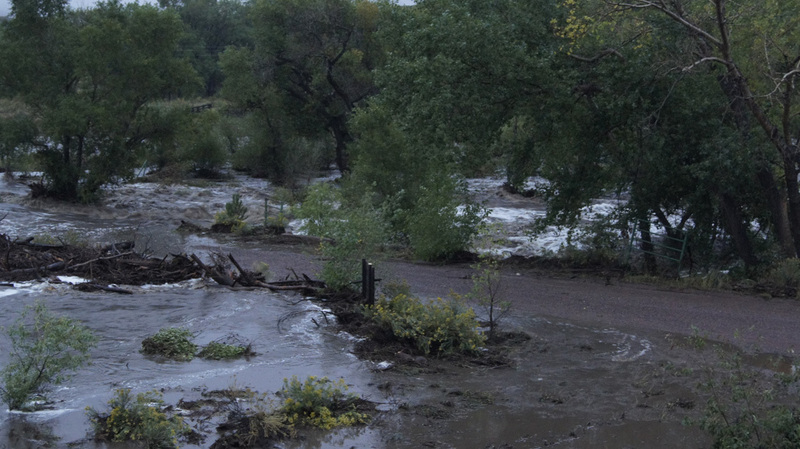 We learn that the St. Vrain has flooded the highway at the Rainbow Bridge, the bridge from Blue Mtn Road (hwy 71) to the Apple Valley Road. John and I drive down about noon, and I posted photos on my blog. It rains all day Thursday. We see no helicopters or rescue vehicles. By 3 p.m. on Thursday we lose power, and by 8 p.m. we lose our landline (and DSL, of course). There has never been cell phone service in the valley, so we are totally cut off from easy communication with the rest of the world. Our community meetings are a sanity saver. We watch the Little Thompson on Thursday. 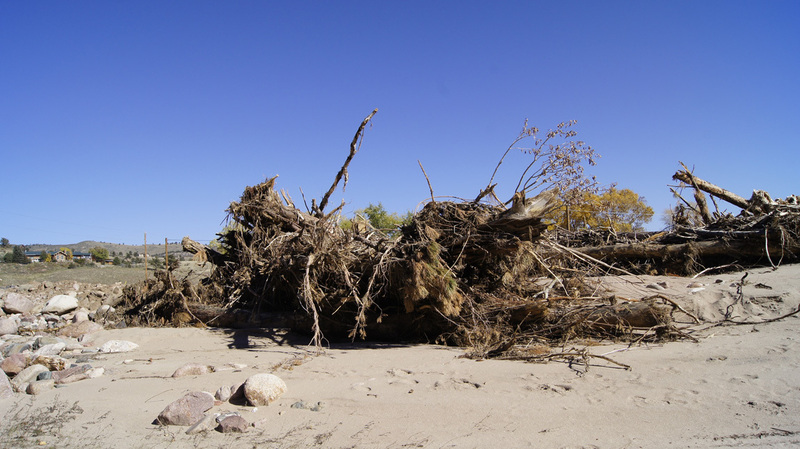 Huge trees, stripped of limbs, float down the river like twigs. A semi-trailer is stuck for awhile against the trees below the bridge. Propane tanks, barrels, debris are all swept down our little river. Itâ€™s simply incredible. I took photos and movies and will upload when I get a chance. We have a neighbor with excavation equipment and others with equipment are also trapped in our little area and also the isolated area across the Little Thompson. They begin re-routing the Little Thompson back under the bridge, a project that takes until late Monday afternoon to complete. On Friday, 3 p.m., our community meets formally at the mailboxes. This becomes our daily routine: community meetings at 10 a.m. and 4 p.m. to share news and critical resources. Volunteer fire department guys live on both sides of the Little Thompson and are in radio communication with each other and the authorities in Lyons; this news is communicated at the meetings. Friday we settle in to camping at our house. We have a generator - it is old but it works. Our house is all-electric (we do not have propane). We can plug in about 4 big extension cords at a time, enough to keep the kitchen refrigerator and the basement freezer chilled, run the microwave or toaster oven, a light or two, charge my laptop and phone and devices, and power the TV. But we run the generator sparingly, because itâ€™s noisy and we donâ€™t have to have constant power. Itâ€™s warm enough, so we donâ€™t have to heat the house. I am a packrat, and figure that I have enough food to last us at least 3 weeks. For water, we cannot move water out of our well/cisterns (takes electricity), but we do have 55 gallon drums of drinking water in the basement, and an above-ground swimming pool full of water. We have the gas grill and a camping stove. We bucket water to the toilets, and heat water on the camping stove for bucket showers. They feel wonderful! Most homes in our area are about like ours. 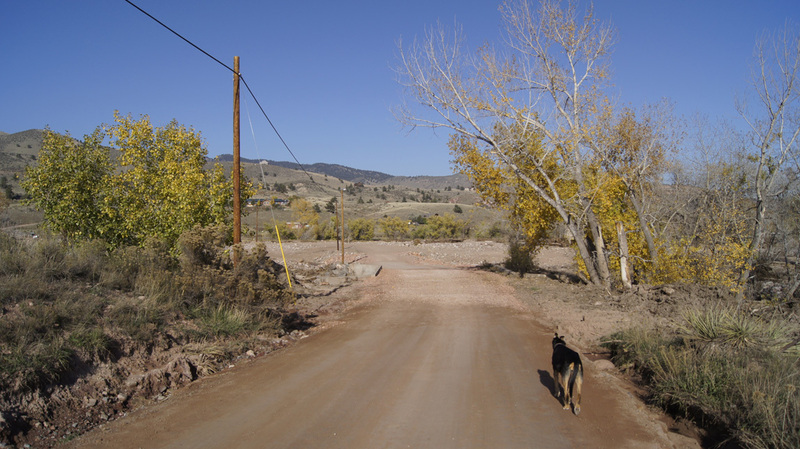 We live in a big valley with most homes sitting on 10-35 acres. Our homes are self-sufficient, and we are used to power outages. Many have generators, we all rely on our individual septic systems rather than a public sewer system. None of us are on city water, so we are used to finding water by alternative sources. 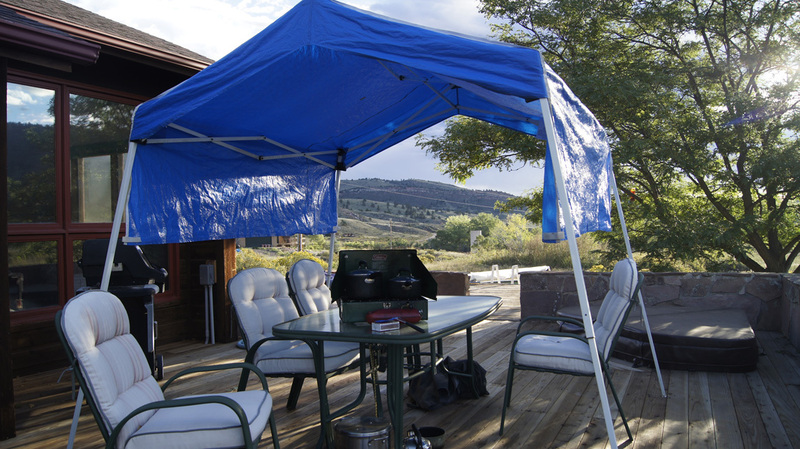 We are camping, but camping with use of the shelter and supplies in our own home. Friday skies cleared enough for helicopters to come to the valley. First, Red Cross and National Guard. Once an expensive private helicopter flew over, we think it was probably governor Hickenlooper. We learn that hwy 36 to Lyons is destroyed at the Stone Mtn hotel. 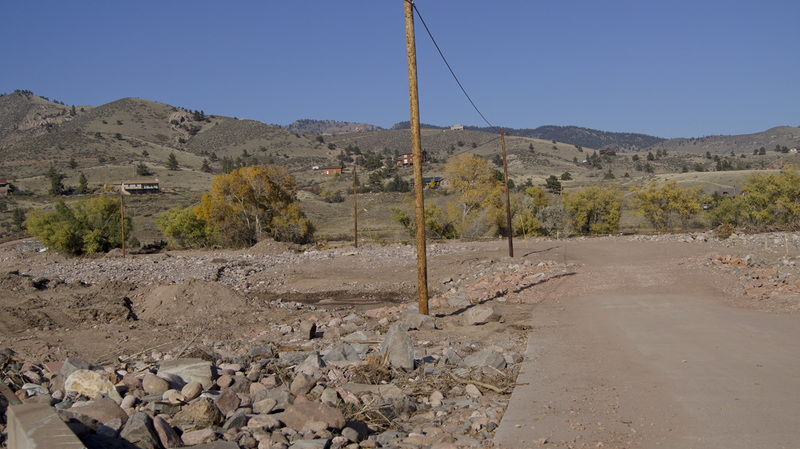 Up towards Estes, itâ€™s destroyed at the Longmont Dam road. 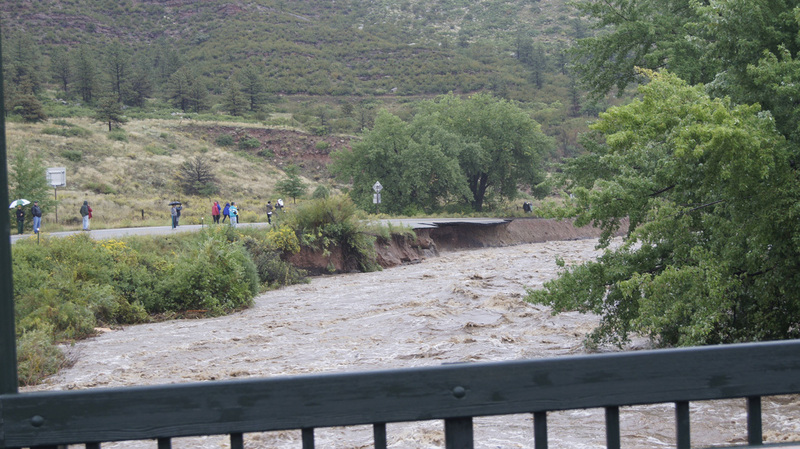 At the end of Apple Valley, the bridge is under water, but the structure of the bridge has held. That is our hope. On Saturday, FEMA trucks come into the valley. They come over the quarry road. Now, John and I have never even been up there. 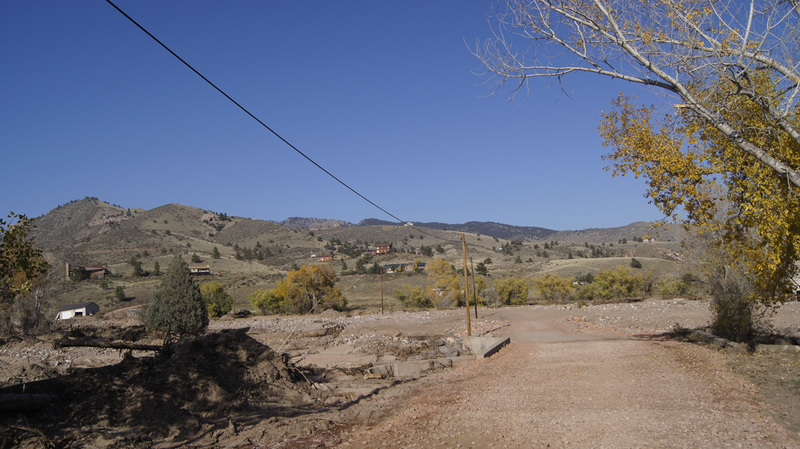 But there is a road up the mountain that the sandstone quarry trucks use to come down to our valley, and there is also a road from the quarry out through Stone Canyon to Lyons. 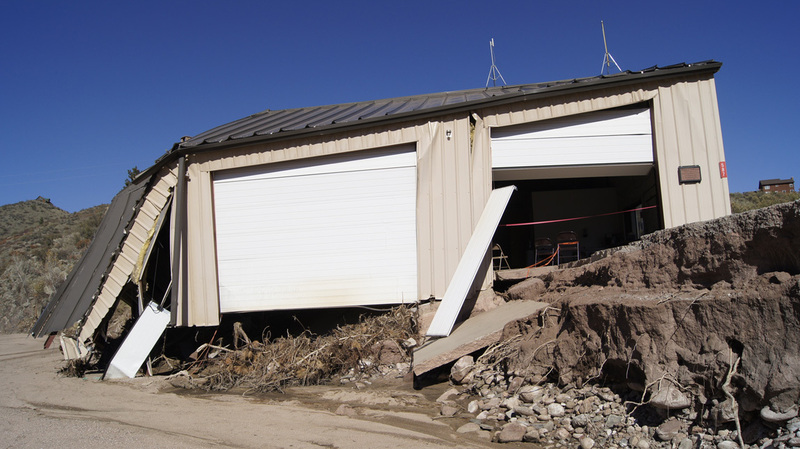 This is the access they use today, as the Apple Valley bridge road is â€œfragileâ€. We are offered evacuation, but decide to stay. The government guy who came to our house was very friendly and quite frankly, I think he was glad that we were totally self-sufficient: one less family that they had to help. 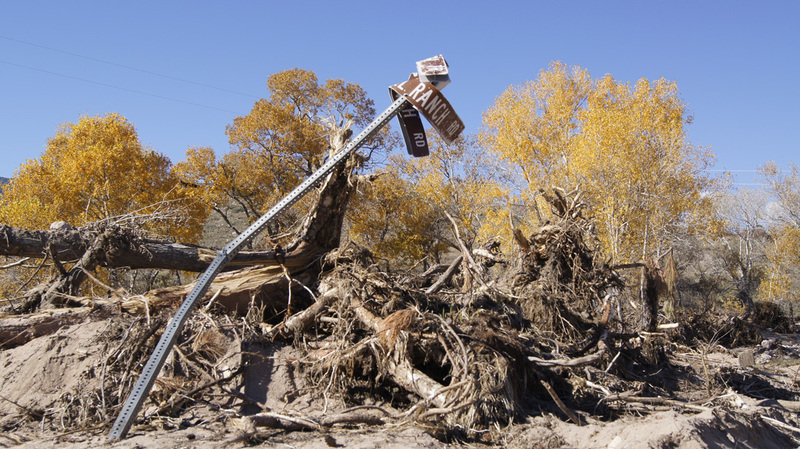 By Sunday, the road/bridge through Apple Valley to Lyons and then on to Longmont is passable. Our community is allowed to use 2-3 trucks a day to make a run out for essentials. Gas for the generator is our essential need. At community meetings, people bring eggs and any other extras that they have. Everyone speaks up their needs: hay for horses, bread, milk, water, etc. Lots of people back here have freezers full of game meat or beef. A board lists local people who are medical workers and vets, as well as where to find a phone or cell service. Josh Buster, who runs the quarry, tells us that we can go up the quarry road and use the wi fi and phone access up there. There is also a spring for drinking water. 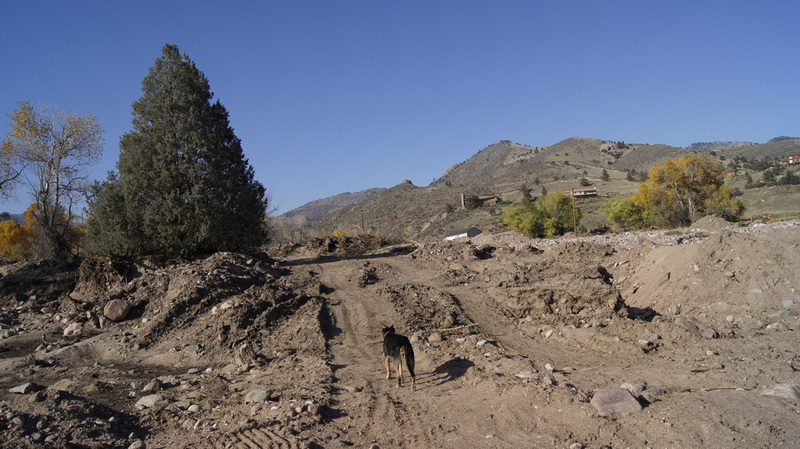 Today (Sunday), if we really wanted or needed to, we could drive our car out through the Apple Valley road. But we could not come home. We stay in our community. Itâ€™s a good feeling, knowing that we are a community. Here is the sad damage. Tomâ€™s house, the original X Bar Seven homestead house (we still always call it â€œBrowningsâ€), flooded Thursday night. Half of the house is gone, and he and his partner were stranded on an island formed by the Little Thompson. He signaled us for a helicopter on Friday morning; his partner has medical issues and needs to get out. Four or five other homes further down the Little Thompson were destroyed. At a community meeting, I talked with a woman I know from pilates: her home was destroyed. 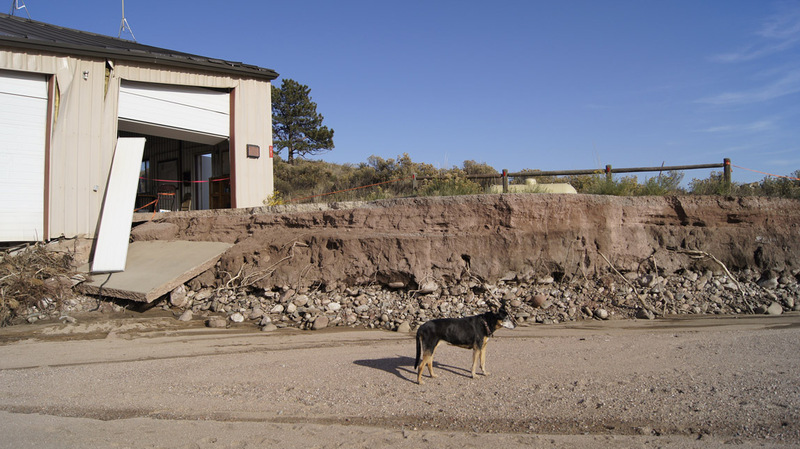 The original Buster home was flooded. Shelleyâ€™s Cottages are gone. 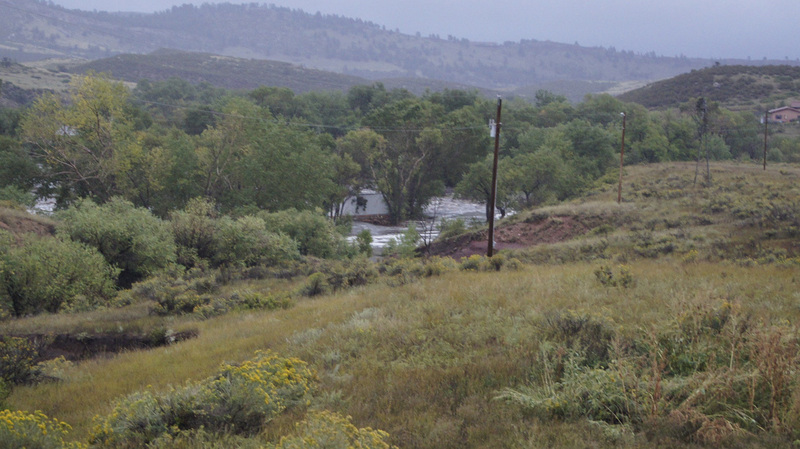 Probably other cottages and homes up the way towards Estes are gone too. The town of Lyons is completely evacuated, except for a few hardy people who are willing to live without city services (they have to boil drinking water, and have no flushing toilets). 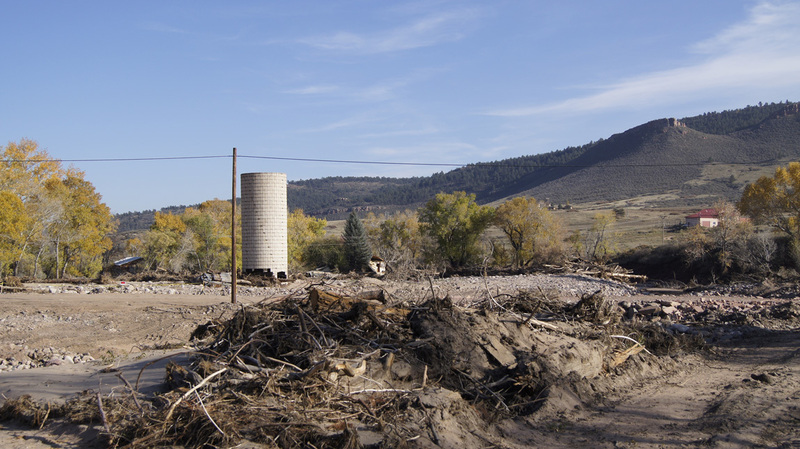 The flood damaged or destroyed all of the Lyons homes that were on the rivers. 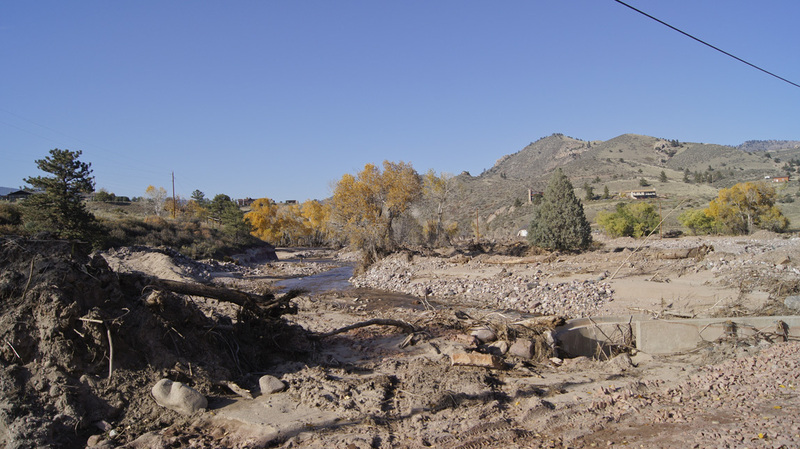 The bridge at the junction of hwy 36 and hwy 66 is probably destroyed. 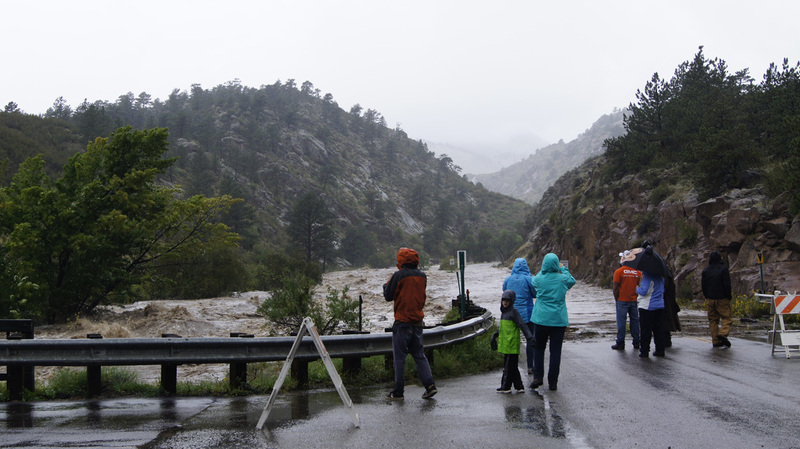 For a time on Thursday/Friday, all roads out of Lyons were under 4 feet of water. No help got in on Thursday at all. The road between the U Pump It and the Black Bear flooded and is partly destroyed. Both bridges to the high school are destroyed. 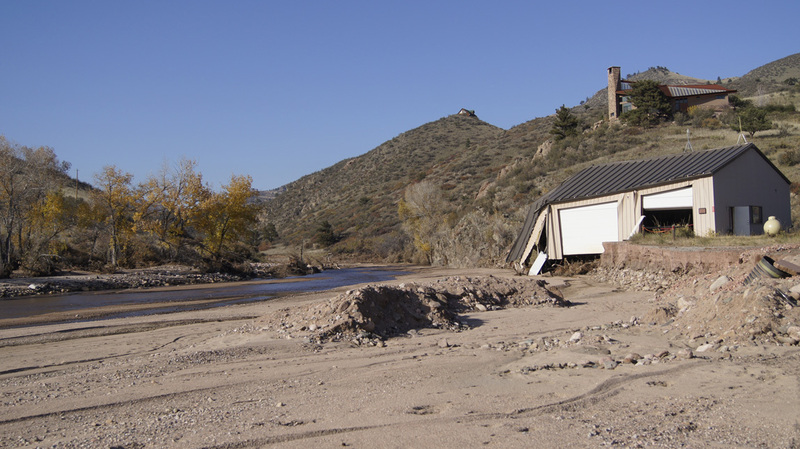 The St. Vrain Market had a foot of water, although the Steamboat Mtn store and the Stone Cup area survived with just some water damage. The new homes by the high school were isolated for several days, no one could get to them because of the flooding rivers. There were other isolated areas; we shall learn all of the stories later. 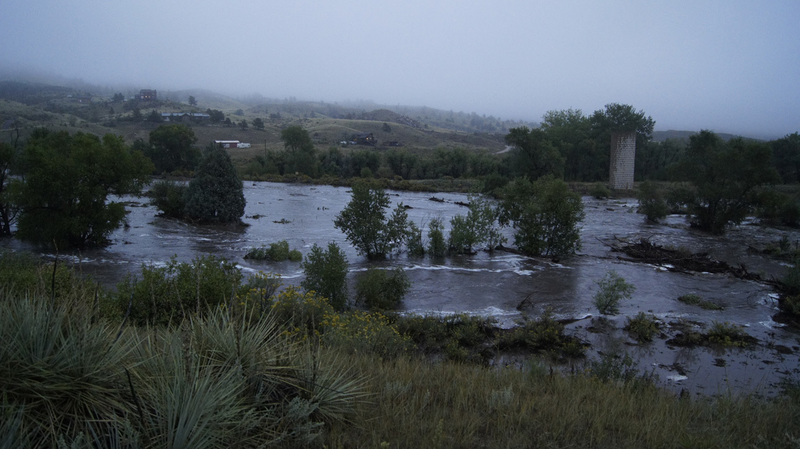 Lyons (the town) was evacuated by big trucks that could get through 4 feet of water and also by helicopter. 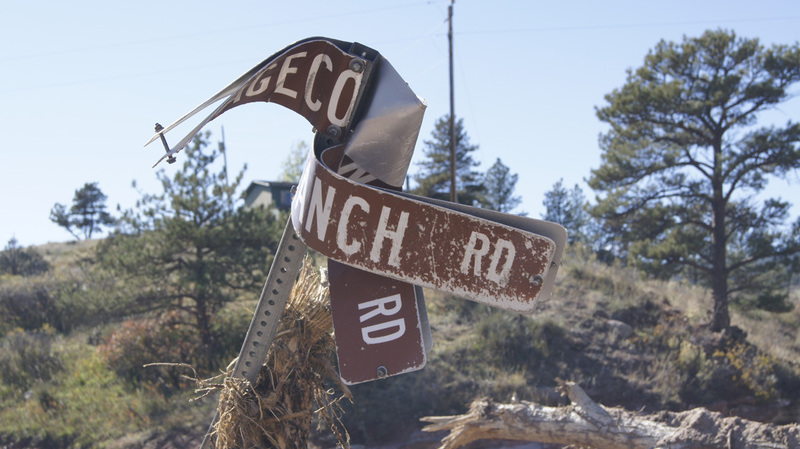 It will take 30 days, minimum, for Lyons to have all services restored. Both schools are closed, obviously. Pinewood Springs was cut off from everything. It took until Monday for the FEMA helicopters to airlift residents out. All road access (except Trail Ridge) to Estes Park has been destroyed. Update, 11:00 a.m. Tuesday. Just back from a community meeting. For the first time, people from across the river can attend. FEMA has designated our area â€œuninhabitableâ€. Well thatâ€™s quite plainly incorrect! But since that is our status, we still cannot get resident passes to egress out through Lyons. They want as little traffic as possible to go that way, because each time a car passes, they have to shut down road work. Our community is sending volunteers to man a check-point at the Rainbow Bridge to prevent anyone without dire need from trying to drive out and disrupt the reconstruction process. We hope that within several days, the road will be fixed enough to allow us to go out and in with resident passes. 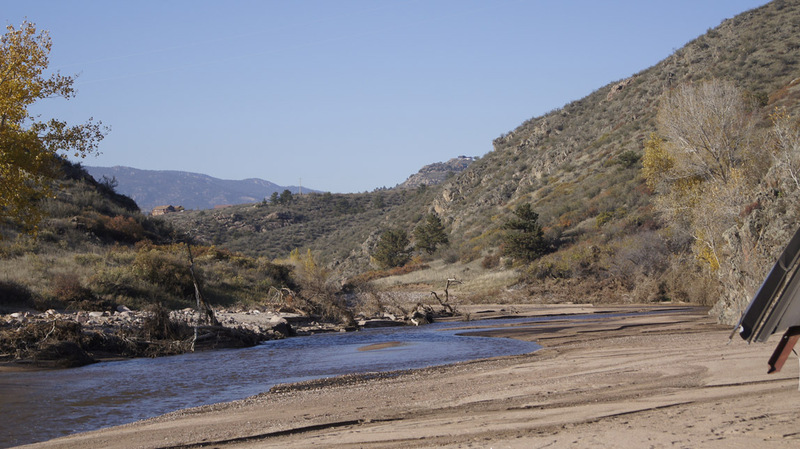 What is working to our benefit is that the highway from Lyons to Estes Park - the road we use to get anywhere - is a major route, so the government is putting tons of resources to work on repairing the infrastructure of our roads and of Lyons. Movie of Little Thompson, September 12, 2013. Photo taken from our upstairs balcony about dusk on September 12. Right in the middle of the swollen river you can see the trailer of a semi truck lodged in some trees. The next morning, it was gone . . . somewhere downriver. Movie of Little Thompson, September 13, 2013. Camping out on our deck. September 12, 2013. We have lived here 32 years and never seen a flood like this one. I guess you can see that we can't go that way either. Not much road left! We know from the news that Lyons is flooded, which means that we cannot even get to Lyons. 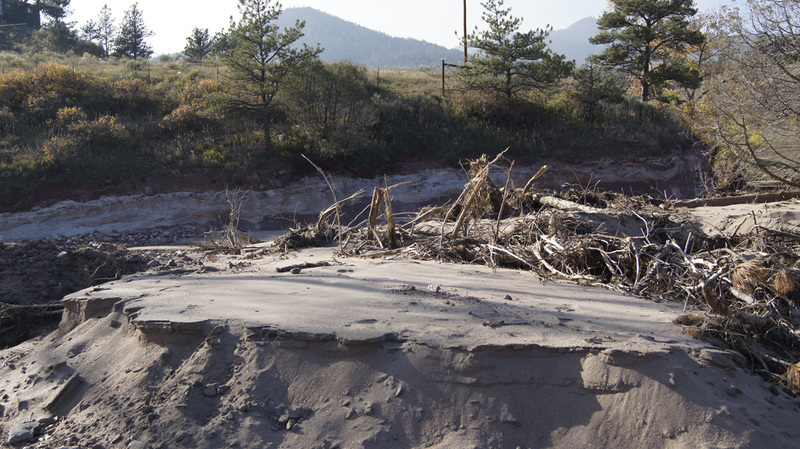 This was caused by the breaching of the Big Elk dam. And the forecast? Rain tonight.